Komandirovochnoe udostoverenie (letter of performance tour assignment) issued by GOSET on May 4, 1941 to S.Ia. 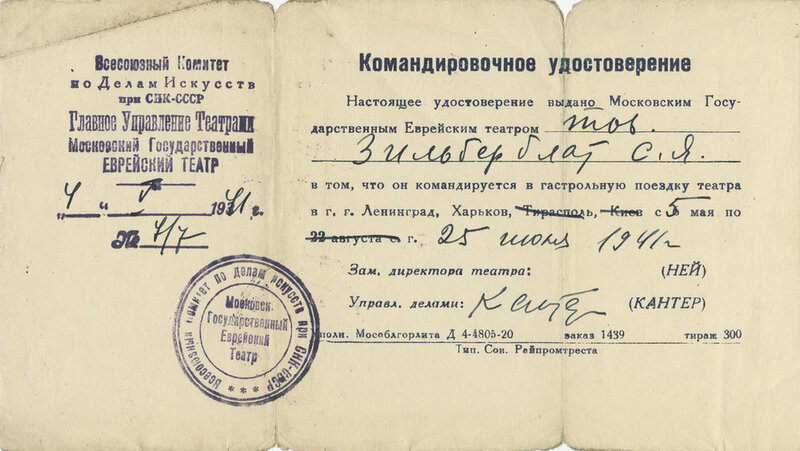 Zil’berblat to certify that he is assigned to join GOSET’s tour in Leningrad and Kharkiv from May 5 to June 25, 1941. Sealed and signed by GOSET’s administrator Kanter. On the theater’s official stationary. In spring 1941, when the theatrical season ended, GOSET (Moscow State Yiddish Theater), like many other Moscow theaters, set on tour to Russian provinces. The troupe and staff members were issued letters of performance tour assignment, such as the one received by Solomon Zil’berblat, and packed their bags, while stage workers prepared props. For two decades it had been GOSET’s routine. However, the 1941 tour was different. The tour repertoire included classics of Yiddish literature: stage adaptation of Sholem Aleichem’s novel “Wandering Stars,” and a comedy “Two Kuni-Lemls” by Abraham Goldfaden, legendary father of Yiddish theater. “Wandering Stars,” directed by Solomon Mikhoels, premiered in Leningrad in May, 1941. Both public audience and critics received the show with great enthusiasm. According to one reviewer, Mikhoels, who presented the love story of two young Yiddish actors as an optimistic take on a tragedy of Romeo and Juliet, not just adapted Sholem Aleichem for stage, but created new original script. On June 22, 1941, in Kharkiv, GOSET had two shows: a matinee, “Two Kuni-Lemls,” and evening performance of “Wandering Stars” at the local Red Army House. Moisei Belen’kii, head of GOSET’s school of acting and close friend of Mikhoels remembered that at noon, when the matinee was well underway, they learned about the German invasion of USSR from a radio announcement and rushed to the theater. Mikhoels interrupted the show and delivered a short and passionate oration, calling to “smash Nazi reptile.” After performing “Wandering Stars” in the afternoon, GOSET left for Moscow.